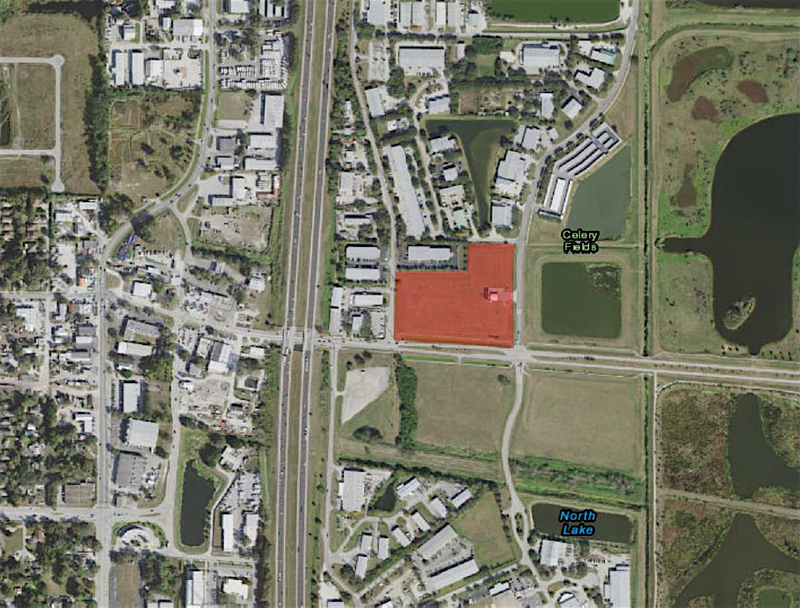 With the Sarasota County Commission preparing to consider next week the rezoning of one of the four parcels the county owns next to the Celery Fields, county staff is reviewing the latest documents filed for the construction of a waste transfer station on property next to those “Quads,” The Sarasota News Leader has learned. 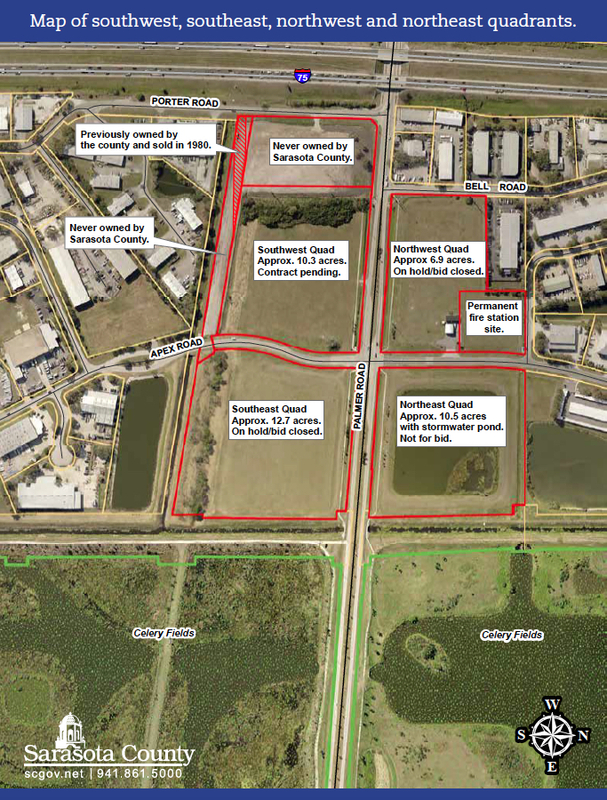 On Aug. 24, Weber Engineering & Surveying Inc. of Sarasota submitted revised site plan documents showing details about the waste transfer station, which would be located on property owned by TST Ventures at 6150 Palmer Blvd. Lawrence R. Weber, president of his eponymous firm and a professional engineer, also provided responses on Aug. 24 to comments county staff issued in mid-June, deeming the project plans Weber submitted on April 25 to be insufficient. During its regular meeting on Oct. 10, the County Commission is scheduled to discuss a report completed by a Miami firm hired to analyze the potential rezoning of what is called the “Northwest Quad.” That parcel is south of the site planned for the waste transfer station. The October 10 session will be held at the County Administration Center on Ringling Boulevard in downtown Sarasota. The agenda was not available prior to the News Leader’s publication this week. As part of a Nov. 28, 2017 discussion, the commissioners agreed to have an outside consultant analyze the Northwest Quad in preparation for their plans to sell it. At the time, the commissioners were working with county administrative staff on a number of options to plug a multi-million-dollar budget gap for the 2019 fiscal year — which began on Oct. 1 — as well as deficits expected in future fiscal years. Using a technical term, the report prepared by Lambert Advisory LLC of Miami said the “highest and best use” of the land would be industrial development. Lambert Advisory estimated the Northwest Quad is worth approximately $1.3 million, if it is rezoned for industrial purposes. As for the waste transfer station proposed in the same area: In an Oct. 1 email response to News Leader questions, Ashley Lusby, the county’s Emergency Services media relations officer, wrote, “[T]he project is not authorized at this time.” She added that staff review of Weber’s comments was still underway. 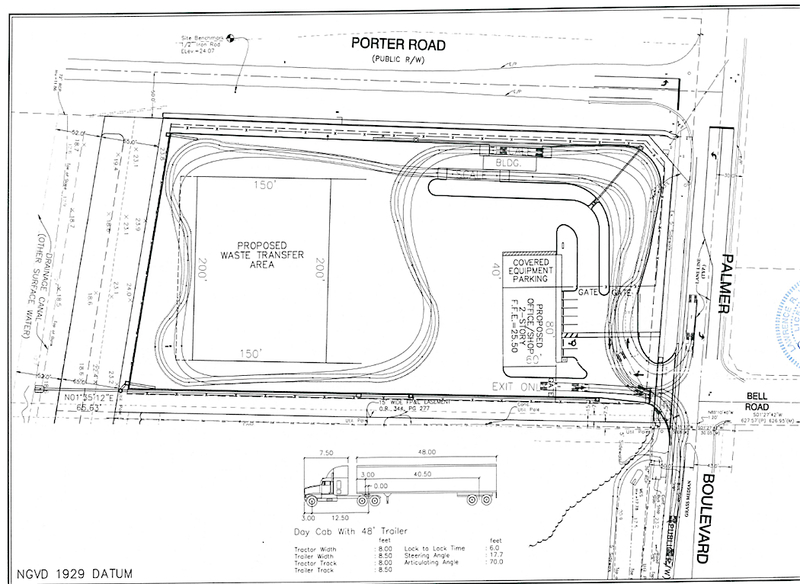 On Oct. 14, 2015, the County Commission voted unanimously to approve that special exception petition to enable the owner of TST Ventures — James Gabbert — to build the waste transfer facility on about 4.28 acres located at the intersection of Porter Road and Palmer Boulevard, east of Interstate 75. With that decision, the board also affirmed the proposed site plan. The waste transfer station would be built next to a 10.3-acre county parcel known as the “Southwest Quad.” In August 2017, Gabbert failed to win County Commission approval for a construction and yard waste recycling facility on that property, on which he had placed an option for purchase. Following the 3-2 denial vote, he decided not to buy the land. He had planned to combine the Southwest Quad with the property already slated for the waste transfer station, for a more expansive operation. Commissioners Nancy Detert, Paul Caragiulo and Charles Hines cited a number of issues in denying Gabbert’s rezoning petition for the Southwest Quad, including the inability of the adjacent road network to support traffic the recycling facility would generate, as well as the growing national and international popularity of the county’s Celery Fields stormwater site among bird-watchers and other aficionados of ecotourism. Commissioners Alan Maio and Michael Moran voted in favor of Gabbert’s project. Along with addressing the county staff concern about the orientation of the slab, Weber provided comments on 17 other issues in his Aug. 24 letter. Among them, he acknowledged notice from the Planning Services staff about a potential insufficiency in regard to the zoning comments on the materials submitted in April. “If deemed more than a minor modification from the Special Exception Development Concept Plan, an amended special exception will be required,” the staff comment said. 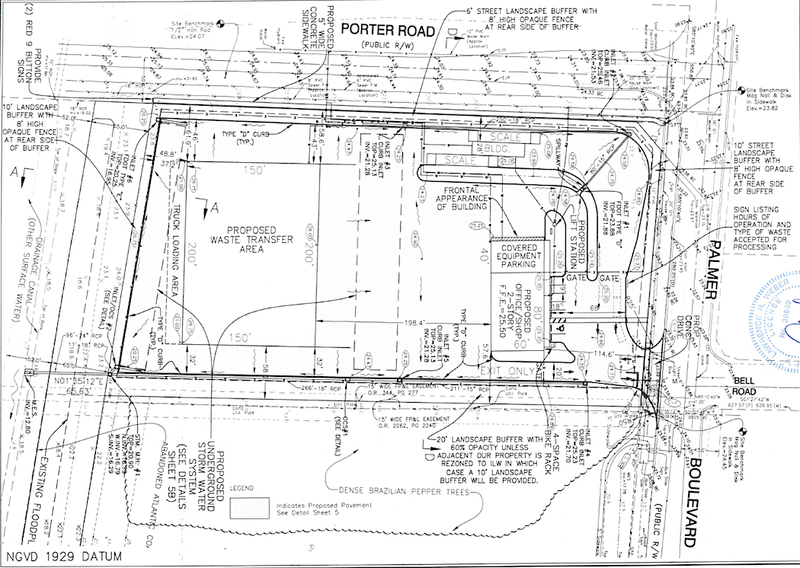 Both the April 25 site plan materials and the revised set submitted in August note that the zoning of the property is Industrial Light and Warehousing (ILW) with Special Exception. The April 25 materials also said that the total area of the project would be 252,743 square feet and that the proposed impervious area after construction would encompass 145,878 square feet. The revised materials submitted in August pointed out that the total project area would take up 186,605 square feet, with 148,409 of that to be impervious. One proposed building would cover 7,200 square feet, the document said. Weber further noted in the Aug. 24 responses that the second building had been removed from the plan. “All improvement will be constructed in a single phase,” he added. Weber noted in the Aug. 24 letter that a diagram had been included in the revised materials. Additionally — responding to a related staff comment — Weber wrote that a “revised turning template” had been included in the updated materials to show how vehicles entering the site from the east — “especially larger vehicles” — would not encroach into turn lanes or any other lanes. Additionally, he pointed out that signs would be posted at the entrance of the station to alert customers about the materials that would be accepted. 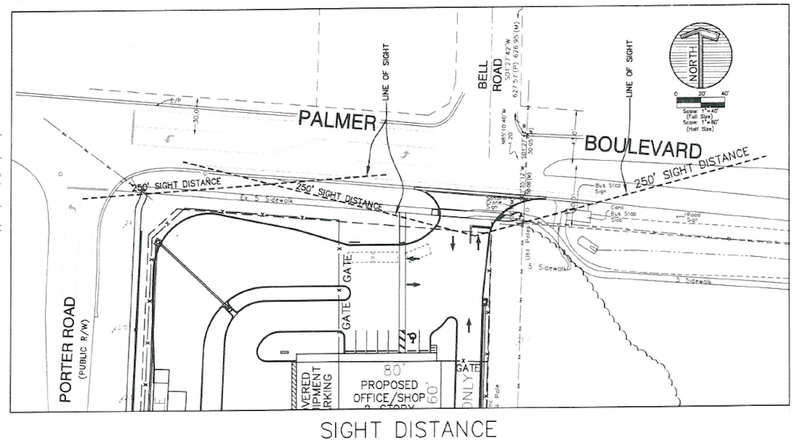 Such signage had been added to the plans, Weber wrote, referencing one of the updated documents. Further, he continued, the “gate to the facility will close at 5 pm’; a sign at the entrance also would list the hours of operation. Weber responded in August that the plan had been changed to reflect that.